In these subjects, known as "short-horns", this capacity improved significantly, but the increase in stature made the oxen unsuitable for working on the hilly and sub- mountain areas of the Marches. Therefore, at the beginning of the twentieth century, widespread cross-breeding with Romagnola bulls was performed in order to decrease stature and improve the structure of the breed. However, following all this cross-breeding, which was done without any precise indications, Marchigiana cattle looked more like a population than a true breed. For this reason, a decision was made in 1932 to stop any type of cross-breeding and to proceed with improving the breed through selection conducted according to directives that entailed listing in herd books. Marchigiana cattle have succeeded in earning itself an important niche, starting right from its very origins. In fact, the breed has spread from the Marches area throughout all of central Italy, even going as far as the southern regions. As of the 1970’s, the Marchigiana breed has also been exported to various countries including the United States, Canada, Brazil, Argentina, Great Britain, and Australia. Now, countries in northern Europe are also starting to discover the potential offered by this breed, which seems to have gained favor particularly among Dutch breeders. The evolution of the Marchigiana breed into a beef-cattle type has been progressive and significant. Their stature has been decreased, their transverse diameters have been accentuated to a greater extent, their length has been increased and their legs and head have become lighter. The modern-day Marchigiana is a cattle type that has significant somatic development and it is characterized by a high growth capacity and outstanding precocity. 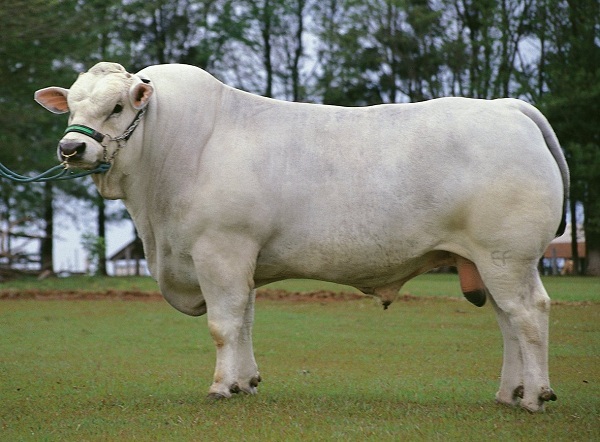 Marchigiana cattle have a white coat that may have some gray shading in the males. The skin and mucosae oris have a black pigmentation. The Marchigiana has a light head with short horns. It has a long cylindrical trunk with excellent muscle development, particularly in the buttocks and thighs. The cows have excellent maternal capabilities and calving is natural, with the calves weighing an average of 45 kg at birth. They also have an excellent growth capacity and in the best specimens weight gain can peak at 2 kg a day. A precocious breed, they reach their ideal slaughter weight at the age of 15-16 month, for a yield as high as 67%.